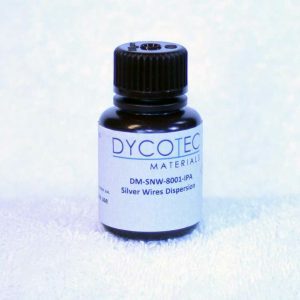 Dycotec Materials provide dispersions based on silver nanowires for transparent conductive coatings. These materials typically work in combination with our protective transparent overcoat inks (DM-OC-6000 range). Offering a cost effective, durable and flexible alternative to TCO (Transparent Conductive Oxide). Applications for transparent coatings include; transparent electrodes for touch screens, PV, OLED devices and display. Silver nanowire ink systems can be tailored to meet a particular specification. We provide our materials to a global customer base, offering a flexible delivery service from samples to high volume production. Produced in a range of dispersions to ensure compatibility with customer deposition processes. Aqueous and non-aqueous based solvent systems are available.